We have developed the engineering functions for the CENTUM CS 1000, a distributed control system for medium and small-scale plants. The aim of this development is to supply engineering programs that will enable every engineer to achieve the full performance capability of their CENTUM CS 1000 without special training. The engineering functions run as Windows-based applications on personal computers with the Windows NT2 operating system. Portability of data has been prioritized to the extent that engineering data can be exchanged between the engineering functions and popular Windows-based spreadsheets or text editor applications in either a comma-delimited text or text file format. To simplify system engineering, default settings have been prepared as far as possible. The user should use these default settings and modify them as necessary by selecting items from the dedicated menus. Engineering work has also been simplified by the categorization of engineering windows into two levels so that a system can be configured with minimal settings initially and with detailed settings later on as necessary. In terms of the debugging and inspection phases, the virtual test function is included as one of the engineering functions in order to shorten the cycle time between debugging, correction, and verification. 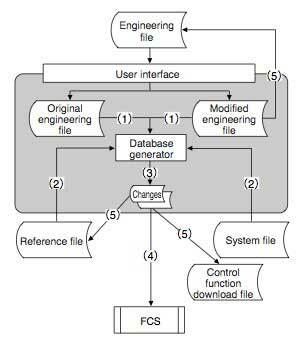 The virtual test function enables the engineer to debug field control station (FCS) databases at the same time from the same personal computer by inputting data values and modifying settings using the virtual FCSs (in that personal computer). .
As controlled objects have become more complex, plant operation schemes more concentrated, and plant operators fewer in number, the degree of engineering for a distributed control system (DCS) has both multiplied and diversified. Despite this, systems are required to be configured in a shorter time while engineering results are required to be of higher quality. Furthermore, in most medium and small-scale plants, the engineering of a DCS is generally performed by inexperienced engineers or those not specialized in DCSs. That is, engineers in such plants are rarely experienced in DCS engineering. Since the engineering functions run under Windows NT, which is used on office personal computers, engineering can be performed anytime and anywhere without requiring a high-performance workstation or dedicated computer. Text files and tables created with commonly used applications such as Microsoft Word2 and Excel2 can be imported to engineering database files, and the contents of engineering database files can be exported to files that can be opened and edited in these applications. This enables initial data to be created quickly and ensures data portability. The values regarded as the optimums are set as the defaults. The engineer should only modify these settings where necessary. The engineer can complete the engineering even if he/she does not know the meaning of all of the setting items. This minimizes the number of settings to be made, thus slashing the time required to create a database. The number of specification items that need to be set and modified in the basic settings is minimized. When more detailed and specific settings need to be made, the detailed specifications can be retrieved for modification. Debugging of modified data can be performed from a personal computer even if there is no actual FCS hardware. This not only reduces the cycle time between modification and verification but also ensures a high level of quality during the coding and debugging phases and minimizes the occurrences of problems when carrying out final inspections using target hardware and factory acceptance tests witnessed by the customer. This report explains each of these features in more detail. Refer to Figure 1 for the configuration of the engineering functions. As shown in Figure 2, the System View window is composed of three panes. The upper left pane displays the hierarchy of the folders containing engineering data. The contents of the folder selected here are displayed in the right pane. The bottom pane displays messages. If the settings in a particular file need to be modified, that file's builder can be retrieved by double-clicking on the name or icon of that file. 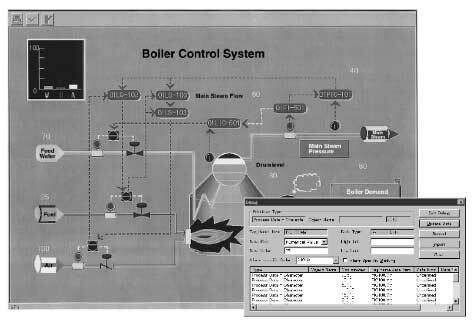 Builders are programs used to modify the settings in the control, operation, and monitoring functions. They are run from the System View window. The builder windows look and feel the same as those of common Windows NT-based applications so users of Windows should not have any problems using them. When a builder window is opened, it displays the minimum required settings. If necessary, click Detailed Setting Item from the View menu to display a list of the more detailed setting items. Figure 3 shows the builder window for setting the parameters of a PID controller block. For the basic setting, the window contains only one tabbed page. 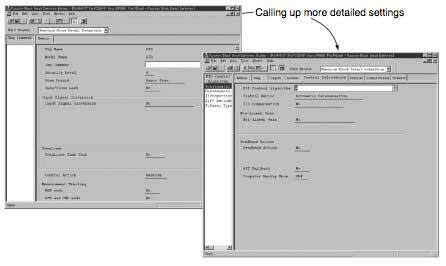 Multiple page tabs for more detailed settings will appear after the Detailed Setting Item is chosen from the View menu. The database generator receives the original data and modified data from the user interface. The database generator creates a database that can be interpreted by the control functions, from the data in the reference file and system file after modification. The database generator compares the modified data with the original, and extracts the changes. The changes only are then downloaded to the corresponding on-line FCS. When the on-line loading has been completed normally, the contents of the control function download file, reference file, and engineering file are updated to reflect the changes. The changes in settings are reflected in the system in these quick five steps. 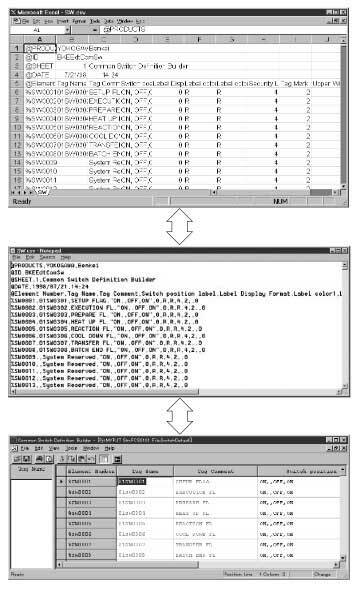 Engineering data can be created using familiar Windows-based applications and imported into the corresponding builder. Conversely, builder-created files can be exported and opened in Windows-based applications for complex editing. In order to import and export data, the created data must be saved in a compatible file format: either the comma-delimited file format common to spreadsheet applications such as Microsoft Excel, or the text file format common to word processing and text editor applications such as Microsoft Word. Figure 5 shows an example of data exchange between a builder file and an Excel file. There are two kinds of debugging functions: one for debugging the control functions and the other for debugging graphic windows. 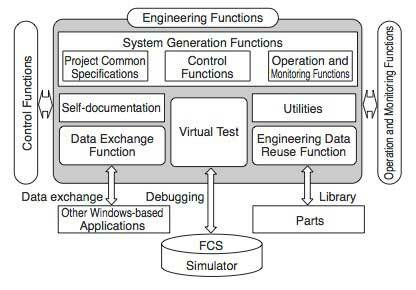 The former is referred to as a test function as it allows the engineer to debug control functions using either actual FCS hardware (a target test) or one of the virtual FCSs within a personal computer (a virtual test). The details of the test function will be described in another report. The capability for multiple engineers to generate and debug graphic windows independently is of great benefit considering the system requires engineering of a large number of graphic windows. Concurrent engineering: whereby engineers can simultaneously perform engineering on the same system from different personal computers over a network. Self-documentation: a function that prints out engineering data as "As Built" documentation to be submitted to the customer. The use of personal computers for the engineering platform of the CENTUM CS 1000 system, offers the following advantages: a dedicated computer is no longer necessary, popular Windows-based applications can be used, and the most up-to-date hardware and software can be employed to keep up with technological advancements. From now on, we intend to exploit these merits to improve the engineering functions and develop more sophisticated applications. Industrial Automation Systems Business Division.